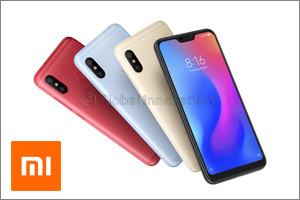 Dubai, UAE, September 26, 2018: Global technology leader Xiaomi and its official distributor Task FZCO is launching new sub-brand POCOPHONE F1 and expand its Android One squad today by introducing Mi A2 and Mi A2 Lite. Mi A2 and Mi A2 Lite starts at 619 AED while POCOPHONE F1 is available at 1249 AED. POCOPHONE F1 is the ultimate device for power users, who can enjoy gaming at high frame rates and use intensive applications without worrying about slowdowns resulting from overheating. It features a 4000mAh battery that can sustain 8 hours of non-stop gaming. POCOPHONE F1 features the flagship Qualcomm® Snapdragon™ 845 platform, the industry-leading LiquidCool Technology cooling system, up to 6GB RAM and 128GB storage. Its technology enables it to deliver sustained peak performance for extended period. Internal testing shows that this system is 300% more effective than conventional, non-liquid cooling solutions as it allows heat from the CPU to dissipate quickly. POCOPHONE F1 comes with AI dual camera and 20MP front camera for uncompromised photography. It churns out gorgeous images with its AI dual camera consisting of a 12MP Sony IMX363 primary sensor with Dual Pixel Autofocus, together delivering amazing photos even in low light and backlit scenarios. On the front, it deploys a 20MP sensor featuring Super Pixel technology that combines the information of four pixels into one large 1.8µm pixel for clearer images with less noise. Both the rear and front cameras are supported by AI features for photos, such as AI Portrait, AI Beautify, and AI Scene Detection. To fully unleash the performance beast, MIUI has been deeply customized on POCOPHONE F1 for a lighter, faster, and smoother experience. Introducing a system optimization feature called “turbocharged engine”, POCOPHONE F1 delivers faster app startups, faster gaming performance, as well as a faster swiping experience due to enhancements in the screen response and animation frame rate. With a new POCO Launcher, POCOPHONE F1 comes with an app drawer that can automatically categorize apps, helping users finds apps easily. Based on Android 8.1 Oreo, MIUI for POCO also prioritizes security with regular patches and updates from Google. It will receive the Android P update in the near future. It sets a new benchmark in the smartphone industry by redefining flagship performance. This new powerhouse will be available comes with an irresistible price tag. POCOPHONE F1 has two versions: 6GB+64GB for 1249 AED and 6GB+128GB for 1349 AED. Mi A2 and Mi A2 Lite product designs are premium while the price has been kept affordable, to benefit more people with the latest advancement in smartphone technology. The phones are armed with notable upgrades from last generation, offering excellent performance, powerful photography capabilities and pure Android experience. The Mi A2 is a photography powerhouse by sporting a 12MP + 20MP rear AI dual camera and a 20MP front camera. It is driven by Qualcomm® SnapdragonTM 660 SoC with the powerful Qualcomm® Artificial Intelligence Engine (AIE). The slightly smaller Mi A2 Lite offers great value too, packaging a 12MP + 5MP rear AI dual camera and a 4,000mAh large battery. Carrying on the Android One tradition, both Mi A2 and Mi A2 Lite have pure Android 8.1 out of the box. The unadulterated system offers the best Android experience with the latest Google software innovations such as smarter batteries that last longer by adjusting to user habits. Supported by Google Assistant and Google Lens, the system makes it easy for users to find answers and get things done on-the-go. In terms of security, users can rest easy with monthly security software updates and Google Play Protect built in. More importantly, Mi A2 receives Project Treble support from Google, meaning the phone can have faster and easier system updates than other Android devices. Both phones can update to Android P in the future. When the high quality hardware of Mi A2 and Mi A2 Lite meets Google's easy-to-use Android 8.1, users get a simply amazing phone experience. Capable of creating “Picture Perfect Photos”, Mi A2 sports a 20MP Sony IMX376 front camera and a 12MP + 20MP AI dual camera—one of the most powerful setup in this price range. The 20MP front sensor features Super Pixel technology that combines the information of four pixels to create one large 2.0µm pixel. This greatly improves the sensor’s light sensitivity, enabling users to capture clearer and brighter images, as well as better videos, in low-light conditions. The front sensor also offers handy effects such as AI Portrait, AI Beautify 4.0 and HDR, as well as a 4500K front Selfie-light, allowing users to take better selfies than ever before. The rear 20MP camera also uses Super Pixel technology, and users can manually select the 20MP camera or the 12MP camera according to environment lighting. The 12MP camera has a ƒ/1.75 large aperture that lets in more light than comparable smartphone cameras. Mi A2 Lite sports a 12MP + 5MP AI dual camera on its back. The 12MP primary sensor has large 1.25µm pixels and phase-detection autofocus for fast and accurate autofocus. Mi A2 Lite has a 5MP front camera that also supports AI Portrait Mode, giving you that bokeh effect even without a second lens. Both the front and back cameras support AI Beautify and HDR. Powered by Qualcomm® SnapdragonTM 660 platform with Artificial Intelligence Engine, Mi A2 offers a crisp, smooth experience in almost any circumstances. Advanced Kryo architecture with Arm’s big.LITTLE construction means that Mi A2 offers a perfect blend of performance and power-efficiency. It’s great for both gaming and daily usage. Mi A2 features a large 3010mAh battery and supports Qualcomm’s Quick Charge 4.0. The premium version has 6GB LPDDR4x RAM and 128GB storage. Mi A2 Lite offers great battery life with its impressive 4000mAh battery that will easily last for 7.5 hour of continuous gaming and 16.5 hours of non-stop video streaming. The great battery life also owes to the power-efficient Qualcomm Snapdragon 625 platform, allowing Mi A2 Lite to cope with demanding 3D games while maintaining excellent battery life. Mi A2 Lite is the first Android One device to feature a unique 19:9 display. This 5.84” FHD+ full screen display is able to be housed in a relatively compact body, making it very convenient for one-handed use. The screen also comes with useful features such as Auto Contrast, Reading Mode and Night Mode. The 2.5D glass screen is paired with a metallic-finish body, a unique look not found elsewhere in this device segment. Mi A2 has two versions: 4GB+64GB for 919 AED and 6GB+128GB for 1079 AED. Mi A2 Lite also comes two versions: 3GB+32GB for 619 AED and 4GB+64GB for 749 AED. Xiaomi is also bringing the latest iteration of its wildly popular wearable to UAE, Mi Band 3, packed with exciting features, including a large OLED touchscreen display, improved alerts and 50m water resistance. For the first time in the Mi Band series, Mi Band 3 users will be able to swim with it, thanks to the 5 ATM water resistance. With a 0.78-inch OLED display, Mi Band 3 can now display content of messages, in addition to basic data such as time, date and steps taken. It features a sleek, minimalist unibody design, fitting perfectly into users’ lifestyles. Navigating is simple as well — users can swipe up and down to scroll through menu items and left and right for more options. The touch button at the bottom of the screen serves as a home button or for activating additional features such as clearing notifications or measuring the heart rate. Other new features include a built-in stopwatch, a phone locating function, and an independent vibrating alarm function that works even when your smartphone is turned off. A dedicated interface on Mi Band 3 is activated when a workout starts through the Mi Fit app, allowing users to view real-time workout stats by simply glancing at the touchscreen display, as well as historical data and analysis on a daily, weekly or monthly basis. Mi Band 3 is priced at 129 AED. Mi Laser Projector 150” is an ultra-short throw projector that can project up to 150 inches when placed just 50 centimeters away from the wall. With cinematic quality images and high fidelity sound, it delivers a true cinematic experience within the living room. Mi Laser Projector 150” utilizes ALPD 3.0 laser technology developed by Appotronics, a technology that has been adopted in commercial cinemas. By DLP technology from Texas Instruments, Mi Laser Projector 150' not only displays vivid details, but also reproduces vibrant and rich colors accurately. Aside from delivering extraordinary imaging performance, Mi Laser Projector 150” also offers an immersive audio experience, thanks to its speaker system that supports Dolby and DTS technologies along with its built-in 15W x 2 full frequency and 15W x 2 high frequency speakers. Featuring a Full HD resolution of 1920x1080, Mi Laser Projector 150” runs on Android TV™ 8.1 and has a rich array of connectivity options with three HDMI 2.0 ports (ARC x 1), two USB ports, SPDIF port, Wi-Fi and Bluetooth. Presenting a minimalist design, Mi Laser Projector 150” has a white chassis and blends effortlessly into any decor and homes. Installing Mi Laser Projector 150' is also a breeze compared to conventional projectors that may require wall or ceiling mounting, making it the perfect solution for anyone who seeking a full cinematic experience in their living room. Mi Laser Projector 150” is priced at 7,999 AED. All the launch products, POCOPHONE F1, Mi A2, Mi A2 Lite, Mi Band 3 and Mi Laser Projector 150”, will be available at Mi stores, mi-mena.com, Etisalat, Noon, Jollychic and Carrefour from September 26th, 2018.